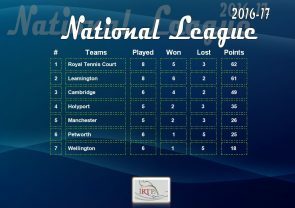 Cambridge’s permier league team travelled to Hampton Court last Friday to take on the team currently topping the table. World number 5 Chris Chapman (who was owing 15) beat Ed Kay 5-6 6-3 6-2. Jamie Giddins continued his imperious form to beat Nick Hatchett 6-4 6-4, to ensure Cambridge took the tie. Next up for Cambridge is the world champion pairing of Rob and Claire Fahey, away at Holyport on 4th April. Following that, Cambridge’s will be hosting Manchester on Thursday, 13th April starting at 4:30pm in the Regular season finale. Please mark your diaries! All support is most welcome as Cambridge continue to press for home court advantage in the knock-out stages!